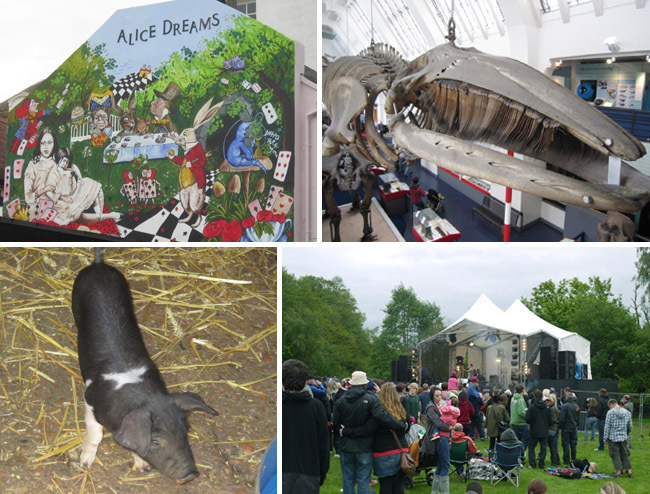 ﻿Pics: Amazing Alice in Wonderland mural in Brighton; Whale skeleton at the Natural History Museum; A piglet; One of the stages at FOM Fest. May involved: Finding my creative motivation again; Going Access All Areas and reporting from FOM Fest in Manchester; Attack the Block; A trip to the National History Museum – Dinosaurs, whale bones and so much more; Kate Bush week on 6music; Starting a weekly swimming routine; New album from Wild Beasts; Eating big, juicy English strawberries; Lots of trips to the farm to see the baby piglets, kittens and lambs; Finding some amazing Alice in Wonderland wall-art in Brighton; Evening walks making the most of the longer days; Psychoville 2; Reconnecting with long-lost friends . . .
How on earth is it June already? This year is really rocketing by!